Ring Krugerrand. 2017. 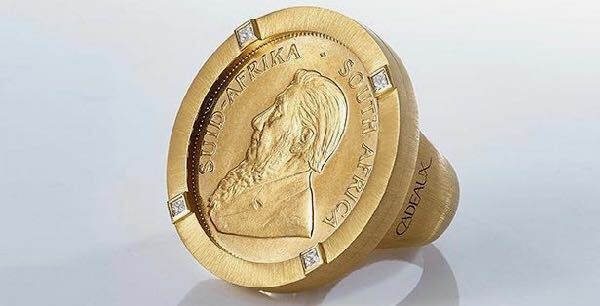 A genuine South African Krugerrand coin weighing 1 ounce of gold with the profile of Paul Kruger and the designation “SUID-AFRIKA·SOUTH AFRICA” showing up mounted in an 18 Karat rose gold ring and set with diamonds. The Krugerrand is a South African gold coin that has been minted since 1967. It weighs 1 troy ounce, or 33.93 g, and is composed of 91.67 % gold (Au) and 8.33 % copper (Cu). Its diameter is 32.77 mm and its thickness	2.84 mm. Its name stems from former South-African president Paul Kruger who’s portrait is featured on the coin and Rand refers to the South-African currency.